Aboard a boat, there is eventually the question of what to do about bathroom issues. There are a wide variety of possibilities, from low-tech to high – everything from porcelain toilets and plumbing leading to a treated holding tank, to the newspaper and Tupperware system, which more easily fits the space constraints of a kayak. In between are plastic portable toilets with a built-in tank, and, more recently, commercially available composting heads with special seats that divide liquids and solids. Liquids are emptied every day or two, and solids go directly into a container with peat moss or wood shavings or some other loose, dry material, which can be emptied at longer intervals. There is of course the cedar bucket option, but that seems a little tacky close in to a populated shore. What with various boat projects, and home arrangements related to health issues, I’ve tried just about every system out there, from porcelain to Tupperware. 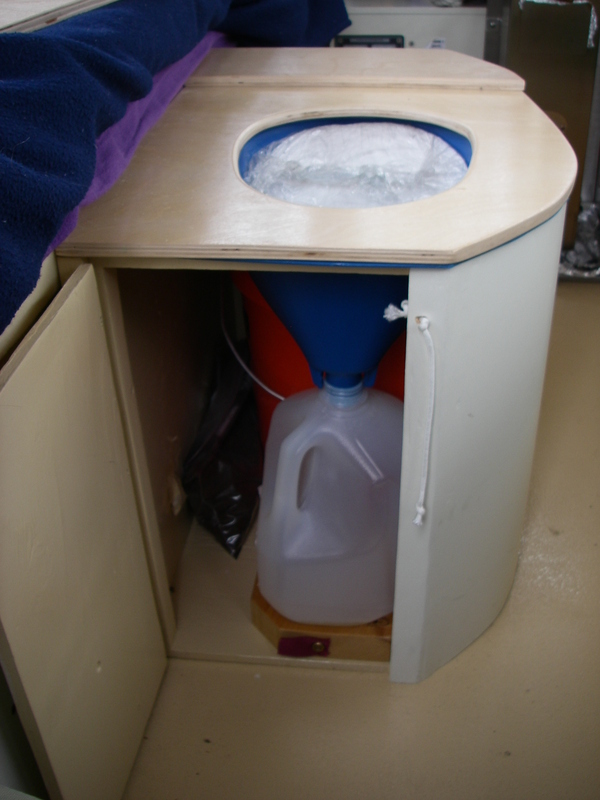 When I started seeing reviews a few years ago of commercially available composting marine heads I was delighted – who knew that you could fit a composting head system (with which I was experienced on shore) into a relatively small boat! Looking at the prices I wasn’t so excited, at $800 or more, and looking at the dimensions and requirements for electrically powered ventilation, I was even less excited. And then the container for the urine didn’t seem well-connected with a small opening, but instead prone to spills in the motion of a small boat on big waves. For a while I was back to the rectangular gray box that river rafters use, which worked fairly well on the Peep Hen. But for the Chebacco I was inspired to think on this again. Ventilation was still an obstacle – I wanted neither the vent pipe in my vertical space, nor the fan, with its noise and power usage. Mentioning this to the Alaskans, Dave said “oh, my brother and his family have a composting system – it’s in a closet in the cabin, and it has no vent, and there is no terrible smell.” Bingo! It should be mentioned that the brother and family also live in Southeast Alaska. This arrangement might or might not be so workable in a significantly warmer climate, but I like to sail north. I looked again at the commercial versions, with the idea that one could simply choose to not connect the vent. Still too bulky, and that issue of the possible spillage. While running around the Internet looking into this, I came across an item called the Privy Kit. http://www.ecovita.net/privy.html This is designed for people with outhouses, on land, who wish to divide the liquid and solid materials for composting. Bingo again! About $100, a special toilet bowl for directing materials where you want them to go. Bonus, the drain point for the liquids, which is intended for connection to a hose, is just the right size for an empty gallon water jug, like the kind that spring water or milk comes in. Well-contained, a workable size, and when the jug eventually gets nasty it can be easily replaced. I haven’t had a use for the Styrofoam seat that comes with the Privy Kit, but friends who live with actual outhouses – which can be seriously cold in the winter – are looking forward to giving it a home. So now we were down to the question of how to put all this together into a boat-friendly system. Additionally, in this boat one goal is to have a head that is “accessible,” meaning manageable from a mobility perspective, in the worst of times. That puts the head right next to my berth, at a height similar to the toilet in the accessible stall of a public bathroom. As it turns out, that design parameter happens to exactly fit what you end up with if you use a regular 5 gallon bucket for the solids container. Think of that! 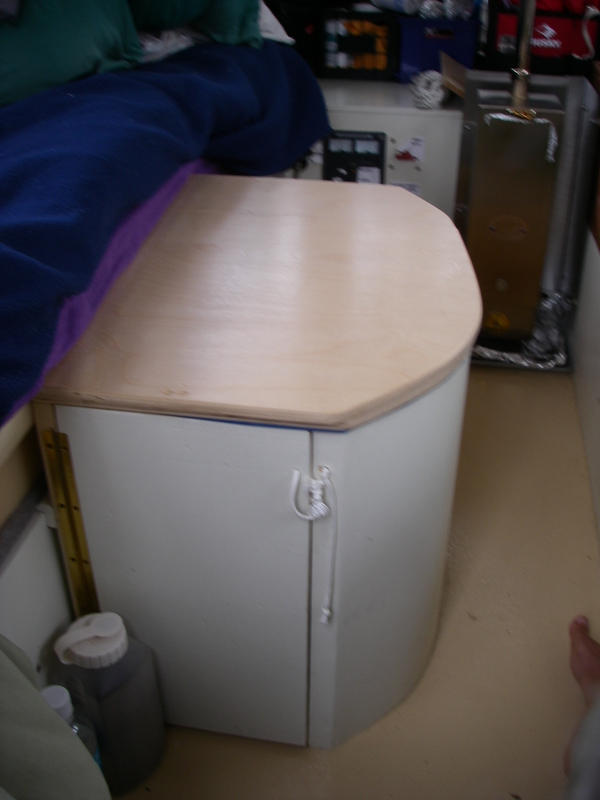 Additionally, for use in this boat, that height makes a convenient low table, as well as a handy seat in between the berths. It’s always nice to have anything on the boat serve at least three jobs, thoroughly justifying the space it takes up. In order to make this a low-smell arrangement, especially since it has no vent, it made sense to mimic the commercial version that has a cover for the solids container. And here’s another one of those serendipitous dimensions of the Privy Kit. They may have planned for the liquid connection to fit a gallon jug, but I’m willing to bet that they didn’t actually plan that the opening for solids would neatly go together with a “splash guard” from a medical supply commode! Somebody else will probably have a much better solution for this, but this one works too: medical supply commodes are those metal frame chairs with a toilet seat that work so well for people who can’t get to a bathroom. They come with a flanged bucket, for use in a bedroom or wherever else, and they come with a flanged plastic sleeve, so that you can put the metal frame over a toilet, as a way to get more height and better handholds. The plastic sleeve then directs everything into the toilet. Which is exactly what we wanted in our five gallon bucket! The inverted commode splash guard, with the larger diameter flanged end down, just fits snugly, at an angle, into a 5 gallon bucket. And, miraculously, the slightly smaller plain edge fits just around the angled outside of the solids opening in the Privy Kit toilet bowl. This takes care of closing off the space between the contents of the bucket and the inside of the head cabinet. After the interior details were sorted out, it was on to the woodworking phase, making the head cabinet. The cabinet has a door for access to the gallon jug for daily emptying, a piece of plywood cut out into a flat toilet seat with rounded edges, hinged onto the top of the cabinet, and another piece of plywood that fits over the toilet seat making a removable flat “tabletop” surface. That top cover piece has another smaller piece screwed onto its underside, that just barely fits into the toilet seat opening, so there is no slipping when the cover is closed. 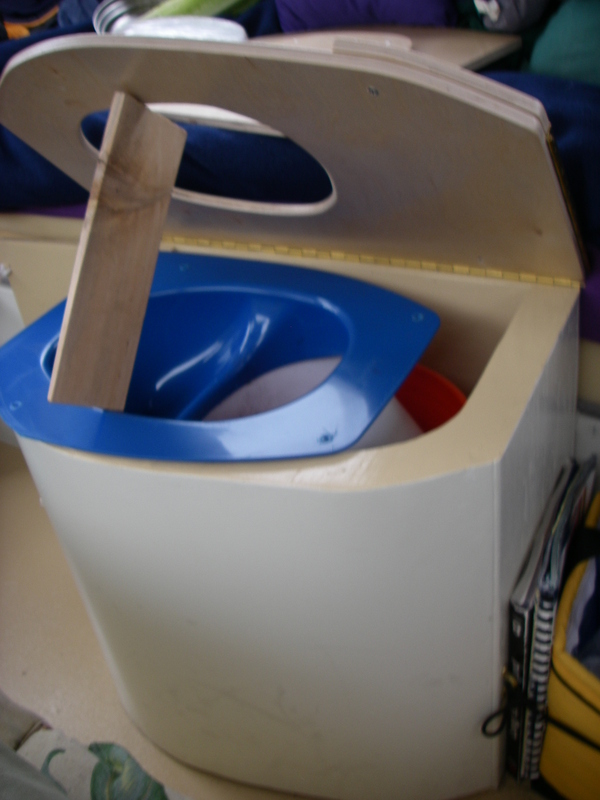 Originally it seemed like that top piece should be hinged, and that’s what we did, so there were separate hinges for the toilet seat (for access to the 5 gallon bucket) and for the top. But that made the top very awkward, and unmanageably big, because the toilet seat piece that it was covering is also the cover for the whole area with the 5 gallon bucket and the gallon jug, one in front of the other, inside the cabinet. So in the end that top cover was divided into two pieces: one to be completely removed for use, and the piece toward the back that did not need to be removed, which was screwed down permanently to the back of the toilet seat piece. This has worked much better than the hinged version of the top cover. It is less awkward, and that back piece provides an edge that makes the removable cover more secure when it’s in place. We thought about hinging the cover at that cut, but didn’t want the scratchy hardware on the surface of the table/seat during the head cabinet’s other uses. I haven’t gone back to check the dimensions of the commercial version of composting head, but I understand better now, why they need to be a bit large. However, building this object into the boat as part of the overall furniture has made it more manageable. As the design was going forward, Theo, who is a highly skilled woodworker, suggested that it would be quite easy to curve the entire side of the cabinet that was going to take up space in the middle of the cabin. What a brilliant idea! You wouldn’t think that this would make all that much difference, but in terms of foot room and space for moving forward and aft in the cabin it has been a wonderful adjustment to the plan. Then after the cabinet was built it was screwed in securely where the long flat side meets the flat side of the port berth. In use, the procedure is to put a half inch to an inch of peat moss (from the garden store) into the bottom of the empty bucket, and a gallon jug onto the drain where the liquids go. Because of the height of the 5 gallon bucket, a piece of two by something needs to be under the gallon jug to support it. Each time solids go into the bucket, peat moss is added to cover it. Each time liquids go into the jug, a little water is poured into the bowl to rinse it. Seawater works fine for this. Toilet paper goes into a separate container. Theoretically, toilet paper will compost just fine. But unless you fold it or crush it into a very compact little wad, it creates too many air spaces and doesn’t allow peat moss to get where it needs to be, and odors are more of a problem. I’ve found it simpler to just get rid of paper separately. If some paper really needs to go into the compost it helps to fold it up, or to pour on some water afterwards. Stray water in the compost is not a problem, and neither is a small amount of urine. It’s also not a problem if “solids” are not really… additional peat moss will take care of all of those situations. Occasionally a rather startling white fungi-looking growth starts in the compost, in one spot or another. This seemed alarming at first, but I’ve found that sprinkling peat moss directly on that area makes it go away completely – maybe it dries it out, or maybe the fungi don’t like the pH of the peat moss. At any rate, it doesn’t seem to be the end of the world, and with peat moss applied it’s almost immediately gone. As for emptying, the gallon jug, with its cover, goes nicely in a canvas bag to carry to a public bathroom, or in open water it can be emptied over the side. In very enclosed harbors – for example Cuttyhunk, or Great Salt Pond at Block Island – I have started a second jug, and stored the first one for emptying all of them after I am out of the harbor. Over the winter we installed a holding tank on AUKLET for exactly this reason. So far it’s just been there for show, but it does mean that the boat is legal for Canada and for the Great Lakes, and if circumstances meant that I would be staying for a week in one of those enclosed harbors, I’d be glad to have the tank. The 5 gallon bucket can be taken care of in a number of ways. I generally empty it every 1 to 3 weeks – it could go longer, but gets heavy. The easiest way to do this is at sea, outside the three-mile limit. Technically, even outside the three-mile limit materials that are legal to dump need to be in small pieces. The following is probably in the category of TMI (“too much information”), but the bucket contents tend to turn into much larger clumps. I have a plastic trowel, the kind sold by camping supply places, for breaking up the contents of the bucket before dumping. The trowel cleans up just fine with toilet paper and seawater, followed by a couple of days of sunshine in the cockpit, which both takes away smells and is an outstanding disinfectant. Far out to sea where nobody is fishing or lobstering I don’t worry about that whole last bit. Other alternatives for the bucket contents are emptying into a trash bag and putting it into trash on shore, emptying into an outhouse at home or along the way, or emptying into a larger composting container at home for further composting, which when finished looks, and smells, like regular soil, and can be used for flowers and trees, though it’s not recommended for vegetable gardens. A 30 gallon trash barrel works well for home composting, with screened ventilation (stopping flies) at the top and enough water to be moist but not soaking wet. It’s important that the home compost barrel is metal rather than plastic, because plastic trash barrels nowadays often have pesticide mixed into the plastic. If all those beneficial composting microbes get done in by pesticide, there will be no compost! Surprisingly, the 5 gallon bucket, with a regular lid on it and a bungee for a little more security, is not nasty as far as smells, and is easy to transport home in a regular car without problems. When it’s doable I empty the bucket at sea, but we also keep a home compost barrel and swap out 5 gallon buckets during shore support visits, for areas like Long Island sound or any of the big bays, where one can easily be in more enclosed waters for weeks at a time. For winter storage it’s a good idea to let the cleaned bucket and other parts be where there is plenty of air movement, like in the garage. Just like the hoses in an ordinary big-boat head system, odors gradually sink into the plastic. But the good news is that given plenty of circulating air, those odors also completely go away. Being an ordinary 5 gallon plastic bucket, it’s also easy to alternate between two, allowing the one that’s not in use to be airing out. This isn’t a big deal, but last year after getting home and thoroughly cleaning the whole thing we reassembled it, ready for spring. Spring came, and after being all closed up for months, we wished we hadn’t done it that way! The bottom line is that the homemade composting head has worked out really well, in over 10 months of daily use, including the seven months last year and 3+ so far in 2013. It has been far more workable, and lower odor, than any of the other head strategies I’ve tried. Who would’ve thought! Hey, I’ve been after you to start a blog on the technology of adaptive sailing…. but jeez…. did you have to start from the “bottom up’? Yes, I know what you mean… That day I had asked myself the question “if I stopped doing this blog tomorrow, what are the topics that really need to be covered?” And this is the one that I have never seen anywhere!